More amicable times: Ephraim Tapa, myself, the Hon. 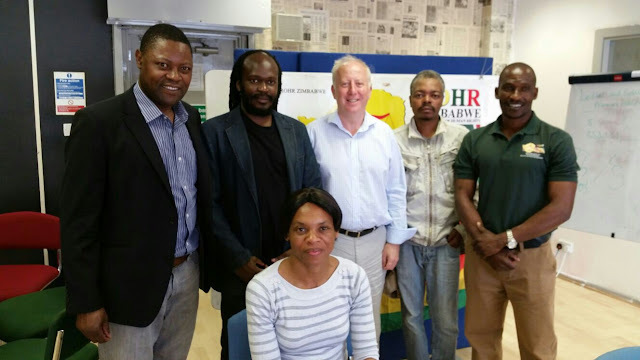 Andy McDonald (local MP) Tanyaradzwa Matera (then Vice-Chair of ROHR Middlesbrough), Ndumiso Ncube (Organising Secretary)and, seated, Tapiwa Merrymore Semwayo.The occasion was the so-called Red Door Event, August 2014, where we highlighted the fact that all the accommodation used by asylum-seekers in Middlesbrough have a distinct red door. Originally slated for June 21, we had to keep moving the date forward, in order to allow for Tapa's schedule, as he wanted to do all the talking. It was only when the MP decided that he could not allow any more rescheduling that Tapa finally turned up. Semwayo then tried to bully the branch into forking out £50 for the Tapa's fuel expenses. I refused, arguing that we had destitute members on whom such an amount would be better spent. In the end, Semwayo paid it out of her own pocket. The leadership of the organisation known as ROHR Zimbabwe International, led by one Ephraim Tapa, are still feeling a certain way ever since our parting in October of 2014, when I was removed from the office of Chairman of the Middlesbrough branch, following the National Conference in Birmingham, where I queried the financial statement. Since that time, I have pretty much moved on to other things. I am involved with two organisations in Middlesbrough, one of which works with asylum seekers and refugees. I am enjoying the success of several new literary projects, including starting a small press. I am also finding the time to appear on television. This Saturday past, I had a book signing in Middlesbrough. I had just about forgotten that I was ever associated with that villainous bunch. Rohr Zimbabwe, or, rather, what is left of it in Middlesbrough, is still bullying members who are known to be on friendly terms with me. I say "still" in reference to that 4-page badly-written attempt at vilifying me that was circulated as a .doc attachment to an email message. The risible piece, for which I have good reason to believe was mostly penned by Ms Tapiwa Merrymore Semwayo herself, was met with a 40-page response from yours truly. I would have thought that was the end of the matter. Middlesbrough is such a small town, and the Zimbabwean community is very small. I am on friendly terms with everyone, their children call me malume/uncle. I receive and offer support to many of these my adopted relatives. These relationships predate the return of Rohr to Middlesbrough at the end of 2013. In fact, it was because of my standing in the Zimbabwean community in Middlesbrough, and the wider society, that I was asked to be interim and then substantive Chairman when the branch was formed. The man they chose to replace the lady who replaced me recently was aware of this, and mentioned me in his acceptance speech, where he expressed the hope that I would play a role in Rohr. What he did not know was that I have already been a member of Rohr, and was now persona non grata. He was promptly removed from the chairmanship. Can someone explain to these Rohr people- particularly Ephraim Tapa and his fawning sycophant (or should that be PSYCHOPHANT?) Tapiwa Semwayo that one does not simply come into my town and isolate me from fellow Zimbabweans? The world of Zimbabweans in this town is far much bigger than Rohr Middlesbrough branch. Trying to force people who still think your organisation is all that stands between them and the Home Office's Asylum Unit to keep away from me simply because our friendship offends you is childish. Such behaviour is more suited for a cult. But then, Rohr is not much different from a cult, is it? 1) Every Zimbabwean asylum-seeker in Middlesbrough who has since obtained Leave To Remain did not do so because they were a member of Rohr. 2) Every Zimbabwean asylum-seeker who has based their claim on their Rohr membership has been refused, even when they may have paid hundreds of pounds for "support letters" etc. A look at the shifting membership list would bring these glaring facts into stark relief. It is only a matter of time before they all realise that no one needs this organisation, or be extorted by it, both financially and emotionally. I have no doubt the Home Office is taking a long hard look at the activities of Rohr. They might want to look at the membership lists and minutes of meetings and see the obvious: most members leave as soon as they get their leave to remain. At best, Rohr activities are unethical, but there may be a few nuggets of illegal stuff for the police to have a look at too. Such as Tapiwa supplying me with what she said was Rohr's registered charity number so that the Middlesbrough branch could open a bank account. I later found out that Rohr is NOT registered as a charity anywhere in the United Kingdom. Myself, and everyone else designated as signatories in the branch minutes could have ended up answering to charges of fraud! If I were Tapiwa Semwayo, I would be more worried about my own reputation than try and tarnish that of someone who has absolutely nothing to do with me at all. Why is it, Tapiwa, that the people you and Tapa collude with to slander me like to say that you are Tapa's, um, pencil sharpener? Ask anyone from Middlesbrough, and they will confirm that Ndumiso Ncube told all of us this much. Fungai Mabhunu repeated the same claim to me in a telephone conversation days after I was removed from the chair. Maybe if you dealt with the fact that your own people find it so easy to speak so ill of you instead of trying to victimise neutral people in order to get to me, your life would be that much better. I think this is the last time I warn you people to leave me alone. I do not approve of what you are doing, but if adults are willing to give you their money in the desperate hope that you can save them against being deported, that is between you and said adults. Nie mój cyrk, nie moje małpy (Not my circus, not my monkey), the Polish proverb goes. But do not use these desperate people as tools in your petty vendetta against me. I may not be God, but my vengeance can be swift and terrible. Think of a shoe stamping a 'roach. My Kingdom for a glimpse at that 40 page letter.